In this day and age, when everyone is concerned with saving energy, a counter top and under cabinet toaster oven are more popular than ever. Most modern toaster ovens not only make toast, but do a variety of other cooking as well. They are perfect for heating up small portions of food, or cooking for one or two people, and saving on heating a full size oven for a small casserole or a couple of pieces of chicken breasts. However, finding the right toaster oven to meet your needs and save space, can sometimes be difficult. The Black and Decker TROS1000 SpaceMaker Digital toaster oven is seen as one of the many Black and Decker home appliances that are designed to be installed under cabinet, allowing you to save space on your counter top for cutting and chopping your vegetables. It also helps keep your counter tops uncluttered and neat. While your husband or father may think “tools” when they hear the Black and Decker name, more and more women are associating the name with useful kitchen appliances like the Black and Decker TROS1000. The Black And Decker TROS1000 SpaceMaker toaster ovens is one of very few under cabinet toaster ovens in existence. Most manufacturers of toaster ovens go for bigger size ovens that need to sit on the counter top. However, not everyone has ample counter top space for all their appliance needs, so having a toaster oven that is off the counter top and still handy to use has its own benefits. The first thing you notice about the Black and Decker TROS1000 SpaceMaker is the fact that this is a true under cabinet toaster oven. For those who need the space on their counter tops, this feature alone will cause a stir of excitement. It’s also a very impressive and modern looking toaster oven as well as will look extremely attractive in most kitchens especially those with a more modern décor. When it comes to the reviews, customers seem to have a love/hate relationship with this Black and Decker toaster oven. While slightly more than half the customers love this appliance, the rest of the customers actually found it wanting in several areas. Overall, the Black and Decker TROS1000 received average ratings from customers across the internet. While the Black And Decker TROS1000 Spacesaver Digital Toaster Oven clearly is not for everyone, it is one of the few options available for those families who need an under cabinet toaster oven. In addition it saves you from having to heat up the oven for small baking jobs and does a great job of making toast. The DeLonghi EOP2047 toaster oven with integrated Panini press is just one of the many kitchen and home appliances made by the DeLonghi company, who have been making popular home appliances for over 60 years. This Italian based company is well known for its new and innovative appliances, and the DeLonghi EOP2046 toaster oven is no exception. This is nice looking toaster oven that looks like it almost does your cooking for you. While it does take up space on the counter top, it can entirely replace both a toaster and Panini press, giving you three appliances in one. In fact, if you have a small family, it may just replace that big oven for most of your cooking needs. Reviews for the DeLonghi Eop2046 toaster oven are excellent, with this toaster oven receiving strong positive feedback from customers. In fact, there wasn’t much that customers didn’t like about this product. About the only complaint with this toaster oven, is the fact that it seems to take forever to make toast. It is true that toaster ovens do not make toast as fast as a traditional toaster does, but the toast does come out nicely brown. Overall, almost everyone who purchased the Delongi EOP2046 toaster oven were happy with their purchase and said that they would recommend this toaster oven to their friends and family. The Breville corporation is known for making high quality small kitchen appliances. The Breville Mini Smart Oven with Element IQ is one of their best selling and popular toaster ovens. 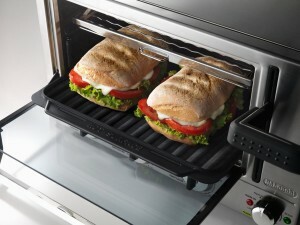 The Breville Mini Smart Oven has a number of features that makes this toaster oven both highly functional and unique. While the Breville mini smart oven isn’t an under the counter toaster oven, it is small enough so that it won’t take up much space on your counter. This little toaster oven seems to be capable of cooking almost everything and looks attractive as well. Reviews for this toaster oven are excellent, with most customers finding that this is the best toaster oven they have ever owned. While a few customers felt that the handle of the Breville mini smart oven is a bit too large, this seems a minor problem compared to the versatility of this oven. While the Breville Mini Smart Oven With Element IQ may not be an under the counter toaster oven, its various features make it extremely versatile and functional, which makes this toaster oven well worth considering. Choosing the perfect toaster oven for your kitchen is no easy task, as you not only have to find one that compliments your current kitchen décor, but you also need to find one that meets all of your needs. To help make your decision easier, we have researched and put together a comparison chart of the best toaster ovens available.